Are your kids obsessed with ROBLOX and Minecraft too? Do they love coding during the sessions that BCSD provides during Library/Media Class, and the #hourofcoding nights? Then they may love this camp from ID Tech camps available this summer at SUNY New Paltz . ”iD Tech is the world leader in summer STEM education, with 400,000 alumni since 1999, and 150 prestigious campus locations including SUNY New Paltz, Stanford, and NYU. Details and pictures in A Little Beacon Blog’s Summer Camp Guide. We have not taken this camp ourselves yet, or heard from other locals who have. This is new on our radar. iD Tech is a Sponsor of A Little Beacon Blog’s Summer Camp Guide. You can be too if you run a Camp! Or if you run a business that helps families, you can sponsor this popular guide also. Details on how to sponsor are here. Photo Credit: Screenshot of Beacon Recreation’s newsletter announcing the new online registration tool. One wouldn’t think that the announcement of the City of Beacon Recreation’s new online registration and payment tool would warrant such celebration, but it is an enhancement that saves time for everyone. Several key elements of registration are now available in one place, including payment, emergency contact information, medical information, and more. Visiting Beacon Rec headquarters is pleasant enough - driving or walking over to the Beacon Recreation Department at 23 West Center Street is always a pleasure, because one gets to see Heidi, Mark, Nate or other employees of the Beacon Rec Department. You might even run into members of Green Teen, who also have an office in the building. But if you, like many parents, are juggling a lot of to-dos, online registration relieves a measurable amount of stress - a worthy trade-off. Plus, you can always head over to the Beacon Recreation building and play at the South Street playground, sled down the hill, or shoot hoops or hit a tennis ball on the courts below. The pre-planning to register is involved, as one needs to fill out emergency contact information for each child when registering them each quarter for the After School Program, a popular childcare program for Beacon’s elementary schools that runs from 3 to 6 pm. To keep up with the paperwork, I’ve actually made several backup emergency contact copies at home with our printer/copier, and I’ve felt quite pleased with myself for the advance prep. “No need for that anymore,” says Nate Smith, City of Beacon Assistant Recreation Director. “Unless you change something, contact information will be the same. Pick your days of After School Program that you want to sign your children up for, and off you go.” Tuition assistance is available to qualifying families. So do inquire if you need that. Spots do fill up fast, and each quarter is a new signup even if you were already enrolled in the prior session. Registration for Camp at the Camp opens on Monday, March 11, 2019, and last year, spaces filled up fast. With a keyboard on your side, you’ll get ahead (don’t worry, there are plenty of amazing camp options available for different schedules, themes and ages). For the Pool Membership, this one is pretty easy. But if you put it off, as I did last year, you might miss out on the ability to have a summer pool membership, and end up limiting yourself (and your family) to the option of buying daily passes. With last year’s seemingly endless thunder rolls, which require everyone to clear the pool for 30 minutes, it can make paying for a day pass disheartening. Thunder can be such bummer if you need to leave the pool right after you paid for your family to get in, then you have to wait 30 minutes to get back in. (BTW, this thunder policy is the same at any pool, including Beacon’s River Pool and All Sport.) Tack on maybe another 30 minutes if another rumble of thunder happens. With the seasonal Pool Membership, no need to scrape together the dollars each time. To get alerts directly from the Beacon Recreation Department, be sure you’re subscribed to their newsletter. You can subscribe to the Beacon Recreation newsletter here. 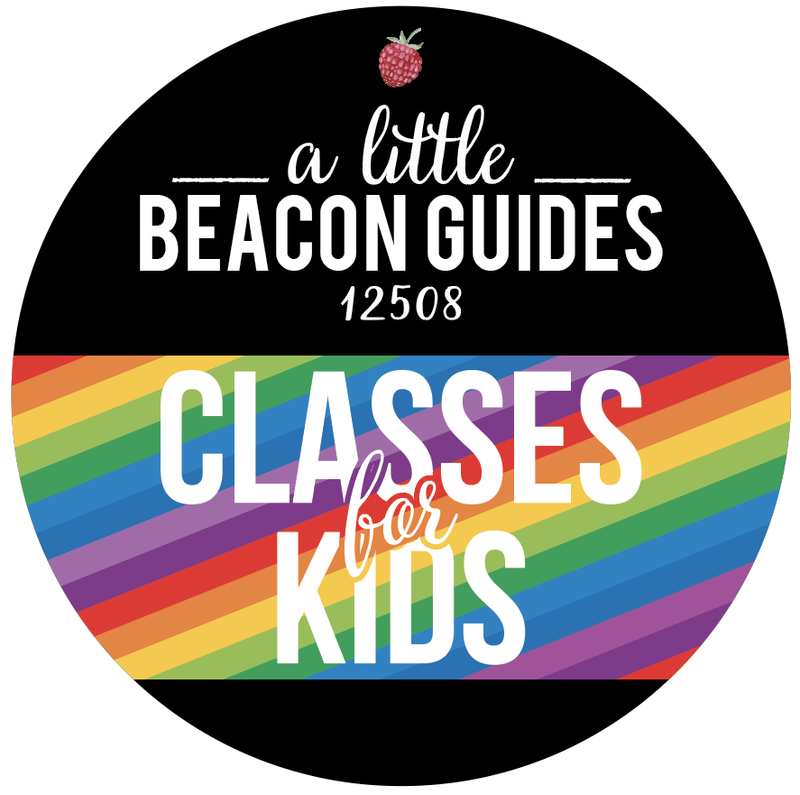 Kids Classes Guide Update: Beacon Recreation Building is Open and Useful! Wednesday, May 16: "We are open, with running water, three bathrooms, power, wi-fi... and coffee! Community hours until 2 pm. Need to charge your phone? Need to get out of the house? The Rec Center at 23 West Center Street has power, wi-fi and big blue blocks/playground for the kids. We'll be open until 2 pm"
Adults, we've got your backs too! Specialty classes are listed in A Little Beacon Blog's Adult Classes Guide for both lifestyle, business and sports. So do check it out, and if you have a specialty class to submit to either Guide, you can do so on our Event Submission Page! The Beacon Youth Police Academy is pleased to announce our 4th annual summer program, July 16 to 20, 2018. This free weeklong program, for students in the Beacon community entering grades 9-12, will provide an introduction to law enforcement, interactions with officers and field trips. A variety of locations will be used to host the program, including Beacon High School. Trips will include visits to local training centers, police academy, court and correctional facility. The goal of the academy is to help participating youth understand the role police officers play in the community, job duties performed and the requirements of becoming a police officer. This program was organized by Joe and Christine Galbo in cooperation with the Beacon Police Department, Beacon Recreation Department, Beacon Mayor's Office, City of Beacon, Beacon PBA and Beacon School District. Our Youth Academy is funded solely by donations from the community. We greatly appreciate the generosity of our local businesses, community organizations and residents for their continued support. An online application can be found here or by emailing beaconyouthpa@gmail.com. The lights onstage in the Beacon High School will not go dark this summer, as the Beacon Players will hold free theater workshops all summer long. They'll meet every Wednesday from July 5 to August 16, from 9 am to noon. This is an open call to all Beacon High School students, including incoming ninth graders, as well as Beacon Players, Cast and Crew. These workshops are a student's best chance at getting audition tips for the fall's upcoming student performance of Cinderella, and for hands-on experience at building the sets. Design work will start on the costumes, as well as on the horses (oh, the glamour!). Theater games will be played, lighting techniques will be practiced, and there will be donuts. Donuts! Registration is not required. Students simply need to walk into the theater on Wednesday mornings at 9 am. Have you ever been to the Storm King Art Center? It's nothing short of amazing. On 500 acres of meadow, fields, woodland and hills, you'll find a collection of more than 100 carefully sited sculptures by highly acclaimed artists. One need not have a lot of art knowledge to have an awesome day - awesome in the purest sense of the word, as in "the experience of being at Storm King produces serious awe." Calling all young explorers! Roam, roll, run, improvise, play, create, and discover the meadows, woods, and art at Storm King. Learn to use a compass! See, sketch, and move like a sculpture! 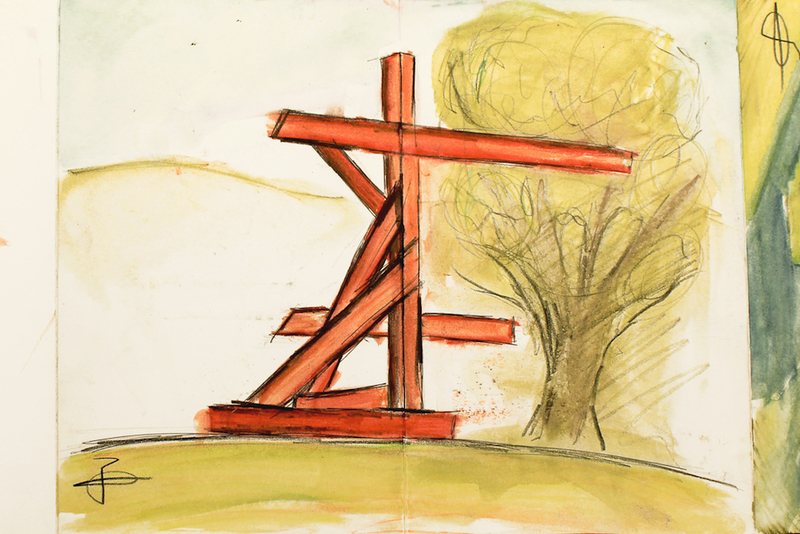 Campers will come away confident about exploring the outdoors and modern and contemporary art. Binoculars, magnifying glass, journal, art supplies, and more will be provided. Spend a week at Storm King engaging in place-based writing, surrounded by sculpture, rolling hills, meadows, and woodlands. Storm King staff and teachers from the Hudson Valley Writing Project share behind-the-scenes discoveries and inspiring insights, launching students into a fun and creative world of writing and art making. Offered in partnership with the Hudson Valley Writing Project. Throughout history, both scientists and artists have used field journals to note their observations of the natural world and develop their ideas. Effective visual and written notation requires keen observational skills, and the practice of creative recording in journals can engage and develop critical and lateral thinking capabilities. Weaving together science and art, The Art of Scientific Observation offers teens a unique opportunity to combine field ecology and artistic practice. 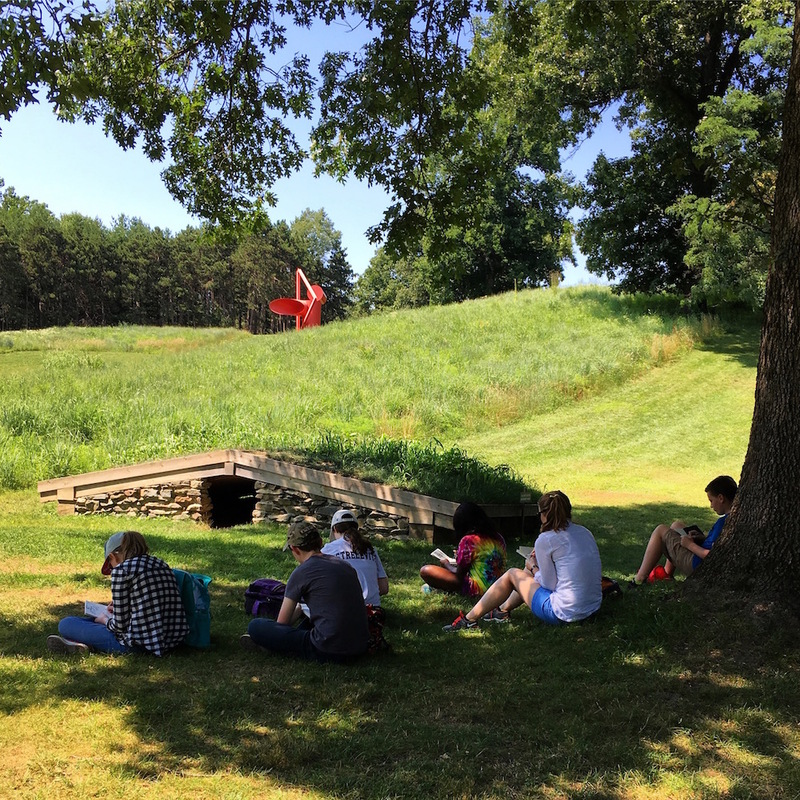 Focusing on daily explorations of plant and animal life, as well as the sculpture and landscape architecture of the Art Center, campers learn about observational and notational methods through creative journal making. Campers will engage with a variety of techniques including sketching, collaging, and writing. Each camper finishes the week having created his or her own experimental field journal. If you're an adult reading this, wishing you could go to camp here, don't worry. Storm King Art Center does offer Family Memberships, which could be your entertainment on Saturday and Sunday mornings. But in the meantime, keep the focus on camp and register now, because space is limited and there are only a few weeks of it offered. Editorial Note: This has been a sponsored article by Storm King Art Center that A Little Beacon Blog's editorial team approved of to write and research, as part of our Sponsor Spotlight series. 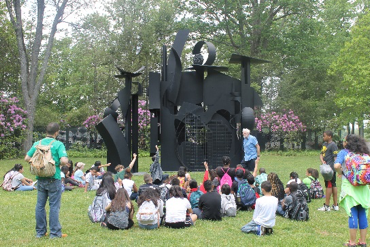 To learn more about Storm King Art Center's programs, including their Summer Camp and Family Membership Programs, visit www.stormking.org as well as their Dedicated Sponsor Page that highlights dates and must-do programs here at A Little Beacon Blog. February has us in the thick of Winter, and for parents, that can mean one thing: thwarted schedules due to 2hr snow delays in the morning, and unexpected afternoon early dismissals with cancelations of all after school programs. This little email message from the Beacon City School District can wreak havoc on your day, especially when there is no snow or rain forecasted, causing parents to miss medical appointments, cancel work meetings, miss work deadlines, cancel work opportunities because they can't show up to work on time, etc. etc. etc. For parents of small children who cannot walk home, or stay at home by themselves, this can mean a thwarting of schedules. For parents of older kids, this can mean wondering how or what will occupy their children's time, especially in the afternoon, when after school activities are canceled. People who work near Main Street know that after school foot traffic really picks up after 3pm when kids get out of school. One reason for a bus backup plan can be busing your child to a designated daycare center. If weather conditions are such that don't have you worried about actually having your child on the road because there is not one drop of snow or rain - as have been the conditions of most weather situations of the 2hr delays and early school dismissals for the 2016/2017 Beacon City School District - then you may fare better with a busing back up plan. Says Jane Savage, a parent of older kids in the Newburgh District: "Snow delays and unplanned early dismissals definitely impacts the family, but we have back up plans. Like sending the kids to the neighbor's house so that my husband and I can both get to work. Having older children and delays are a bigger impact because you want to make sure your kids make the bus versus getting home early to just let themselves in." Many families in Beacon do not have bus pickups at home because they live within the bus zone, where the District feels that the kids can walk to school. So parents of young children must drive the kids to school. Relying on neighbors can be difficult if those neighbors are also working parents and need to be at work, or are out of town themselves. A rotation plan can of course go into effect where everyone rotates who is going to cancel their meetings or go into work late. Delays can have a far reaching domino effect on other people, which can be especially frustrating on days when there is not one drop of forecasted precipitation. 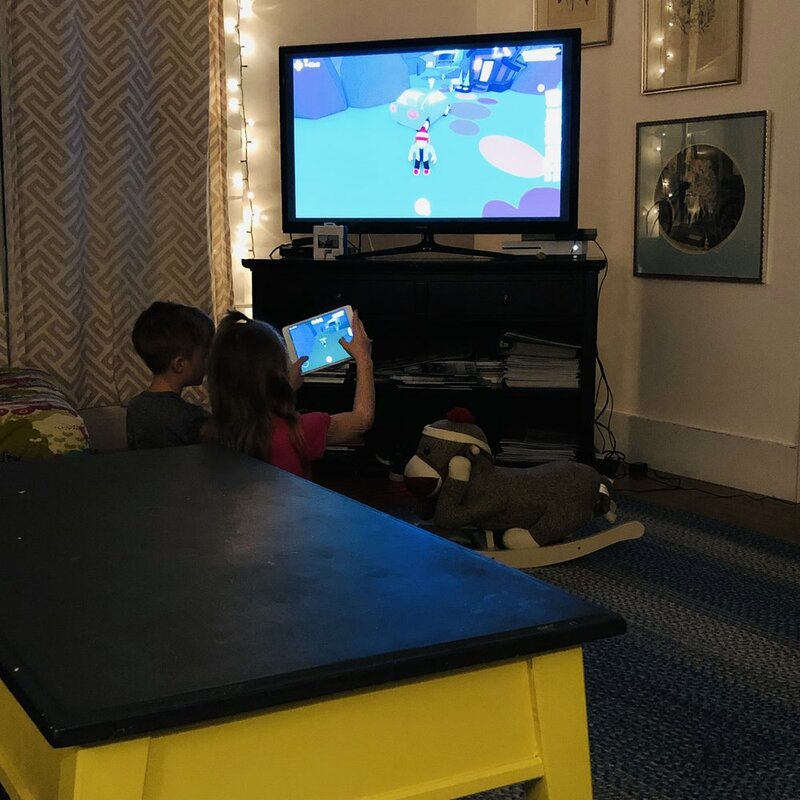 Says Meredith Ginn Carr, a mother in Fairfax Country, Virginia: "For us, a 2 hour delay really knocks off our routine and my 1st grader usually has an off day at school on those days. Last year when I was pregnant and in the 2nd trimetser, I had 4 doctors appointments effected by 2 hour delays. Basically, if I had scheduled a morning appointment, it guaranteed a delay." A supervised place for the bus to drop off your child. If that is a daycare center like Rose Hill or Kids Place, then the center needs to have your child's medical and all forms on file that they would for any enrolled child. If your child goes to Beacon's After School Program through the Recreation Center, that program is held in the public elementary schools and also gets canceled during early dismissals. So, having your child enrolled in at least one day of after-care at another facility that does not close down when the Beacon City School District does, which has happened on sunny days, may be a good idea. Fill out the Transportation Request Form from the Beacon City School District's redesigned website, that makes forms like this easy to find. You can also click here to be taken directly to the page that contains the PDF of the form. If your child is going to a private daycare center or school, you will need to fill out this form each year. The deadline to re-submit the form is April. On the form mentioned above, there is not a box that indicates if you need it for an as-needed basis. There is only the option to select every Monday, or every certain day of the week, or All Days. Write in what you need. As-needed can include pre-planned emergency evacuation drills, unplanned weather delays, carbon monoxide leaks, etc. You must designate what you want done with your child in instances like these, with your choices being: Walk, Bus, Pickup. You will fax the bus form to Gail Morgan in the Registration Department. Once she processes, the Transportation Department is supposed to call you to confirm that your child is on the list. If you don't get a call, you could call them, or you could walk your form into the Registrar's office at 10 Education Drive, and have them fax it to the Transportation Department while you wait, to make sure that they did receive it and did process it. Then you'll know the only department left you need to followup with is the Transportation Department. After we put down the mats and set up the boom box, the morning began with spooky and dramatic organ playing as we moved our arms and pointed fingers to warm up our bodies. Child fitness instructor and founder of FitKidz, Dayna Case (my sister-in-law), led a small audience of mothers and children through different yoga poses and activities to songs, like "Going on a Bear Hunt," except our version was "Going on a Vampire Hunt" with all sorts of creepy adventures as we got closer to finding the vampire. Don't worry - we escaped from him. The first dual yoga I'd ever done was Alice Sipple/Dancing Tree Yoga's class at All Sport. It was called Family Yoga and it was awesome. Alice has since moved with her family to Egypt for a spell, so when Dayna asked me if she could run a Parent/Child Yoga class in A Little Beacon Space, I jumped on it. In a yoga class with pairs, you get to work with and touch your partner. You can put feet to feet and grab wrists and sway back and forth. You can look at each other eye-to-eye, and give each other a spooky face. You can stop in the moments of a busy day to just be with that other person, who in this case, is your child. No telling them to put their socks on, no telling them to stop throwing water. Just moving and swaying, curling and rolling. I don't know! Dayna lives in Columbus, Ohio, so it could happen whenever she passes through Beacon, I suppose. Or if you lead classes like this and want to give a special pop-up experience, contact me with your idea. Meanwhile, see what other events are popping up in this Little Beacon Space. You never know if it will be back, so best take advantage by coming when it's here! After-school options for kids are getting pretty good around these parts. All Sport's new After School Program has been modeled around the success of their Summer Camp Program, Camp FIT. Where once you could only get planned activities in art and sports during the Vacation Camp days or Kids Night Out at All Sport, now parents can sign up their kids for regular afternoons of after-school programming that includes swimming on some days. All Sport's Kids Club is still an option, and is unchanged from what you are used to (aka the childcare room at the club), but the After School Program has more programming and planned hands-on activities with the kids. Unlike with Kids Club, registration with the After School Program means you can leave the club and do errands in the area. You and your children may be veterans of All Sport's group or private swimming lessons, where you have gone - no matter the weather - to make strong swimmers. If you coordinate an After School Day with the swimming lessons, the staff at All Sport's After School Program can walk your child to their swimming lessons. And where might you be? Cardio on the treadmill or elliptical, or running outside around All Sport's Outdoor Park. Toning on the circuit machines with a free, personalized plan of what setting and weight work for you on the machines. Scheduling a Pilates session with Beacon Pilates' outpost studio, located upstairs at All Sport (not included with membership, but a convenient way to utilize Beacon Pilates if you have children). Relaxation in the sauna with a quick shower after. Or... Use this time to relax for an hour, in a massage upstairs. Space is limited in this After School Program, so reserve your days now. Be sure to ask which days have swimming as an activity, and see if you can cross-coordinate with when you schedule swimming lessons (registration for which is going on now and books fast, so call 845-896-5678 to register for swim lessons). All Sport's decorations in their front lobby show how excited they're getting about their new After School Program! P.S. : All Sport's Camp FIT runs all the way until the start of school, so weeks starting August 22nd and August 29th have a few spots left for campers. You can call 845-896-5678 to register, or visit this page for more details. Thank you for supporting businesses who sponsor A Little Beacon Blog as Spotlight Sponsors for our articles. All of our advertisers help make this publication possible. If your business is interested in sponsoring an article, please click here.